Carbohydrates are considered the most basic ingredient of life. Apart from serving as an ideal source of energy, they play other important roles in the body. Carbohydrates consist of sugars and the simplest form is called Monosaccharide. The most common monosaccharide is Glucose. Glucose is produced by plants through photosynthesis. Plant cells break down glucose to release energy during respiration. Glucose is sweet but fructose is sweeter. Fructose is also a monosaccharide with the same molecular formula as glucose but its atoms are arranged differently. The human body processes fructose differently from glucose. A Disaccharide is two monosaccharides put together. An example is Sucrose. Sucrose is glucose and a fructose molecule joint together by a covalent bond. Monosaccharides and Disaccharides are simple sugars which our body can easily process. A carbohydrate that consists of a large number of monosaccharides bonded together is known as a Polysaccharide. Polysaccharides could be made up of thousands of simple sugar units. The role and function of carbohydrates change when they start forming long chains of polysaccharides. Instead of being a direct source of energy like glucose, they function as store houses of energy or structural compounds. Cellulose (a polysaccharide) is the most common structural compound on the planet. It is the most important component of cell wall of green plant. It is made up of thousands of glucose molecules linked together. Humans can’t digest cellulose but cows can, with the help of bacteria within their gut. Polysaccharides are very good energy stores. Another example is Amylose which can be found in bread. Plants store glucose in the form of polysaccharides in their roots, tubers, fruits and seeds, which then end up in your plate. The human body stores excess glucose as glycogen molecules in the muscle and liver. Glycogen is a short term energy store. This means that the glycogen store gets depleted during starvation. The human body stores energy long term as fat. Lipids are smaller and simpler than complex carbohydrates. They are hydrophobic and tend to group together – lipids do not dissolve in water. This is because their chemical bonds are mainly non-polar. As you know water and non-polar molecules do not mix. The basic chemical components that make up lipids are fatty acids and glycerol. Glycerol is a kind of alcohol. A fatty acid is long chain of carbon and hydrogen that ends up in a carboxyl group. A common lipid found in fatty foods is triglyceride. It is formed when a glycerol molecule connects with three fatty acid molecules. 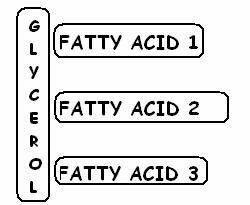 Fatty acids can be either saturated or unsaturated. When all the carbons in a fatty acids are connected to each other with single bonds then the fatty acid is saturated. In a saturated fatty acid, each carbon atom is connected to at least two hydrogen atoms. Only the carbon atoms at the edge will be connected to three hydrogen atoms. When carbon atoms in fatty acids are connected to each other by a double or even a triple bond, the number of electrons left can only bond with less than two hydrogen atoms. This means that they are not saturated with hydrogen, hence referred to as unsaturated fatty acids. Essential fatty acids are those that can’t be synthesized by the body. We have to eat them to get them into our system. An example is the omeg-3 fatty acid. Triglycerides are made up of three fatty acids and a glycerol molecule. If you swap one fatty acid with a phosphate group, you get a phospholipid. Phospholipids make up the wall of the animal cell membrane. The polar end of a phospholipid which contains the phosphate group is hydrophilic. This end is water-loving. The other end is a non-polar lipid end. The lipid end is hydrophobic -- water-repelling. If you throw lots of phospholipids in water, they will rearrange themselves in such a way that the hydrophobic ends face each other and the hydrophilic ends sticking out to face water. Each cell in your body makes use of this natural structural arrangement to form its cell membrane. Another example of lipids is Steroids. Steroids have a backbone of 4 inner-connected carbon rings, which can combine with other molecules to form hundreds of variations. A common steroid is cholesterol. Cholesterol binds with phospholipids to help build the cell membranes. Cholesterol can also be used to synthesize several steroid hormones. Proteins are among the most complicated compounds on the planet. There are tens of thousands of proteins inside you doing their best to keep you alive. They are everywhere and they do a lot. Proteins regulate chemical processes in your body, they help you digest food, they act as antibodies to help you fight microbes that invade your body, they are hormones makes you feel emotions. The ingredients used to build proteins are known as amino acids. There are 20 different types of amino acids. Just like fatty acids, amino acids have a carboxyl group (-COOH) at one end and an amino group (-NH2) at the other end – hence the name amino acid. The amino group and the carboxyl group are linked together by a carbon. This carbon shares one of its two remaining electrons with a hydrogen atom. The other electron is free to be shared with what is known as the R group, otherwise known as the side chain. It is this side chain that determines the shape, function and type of amino acid. 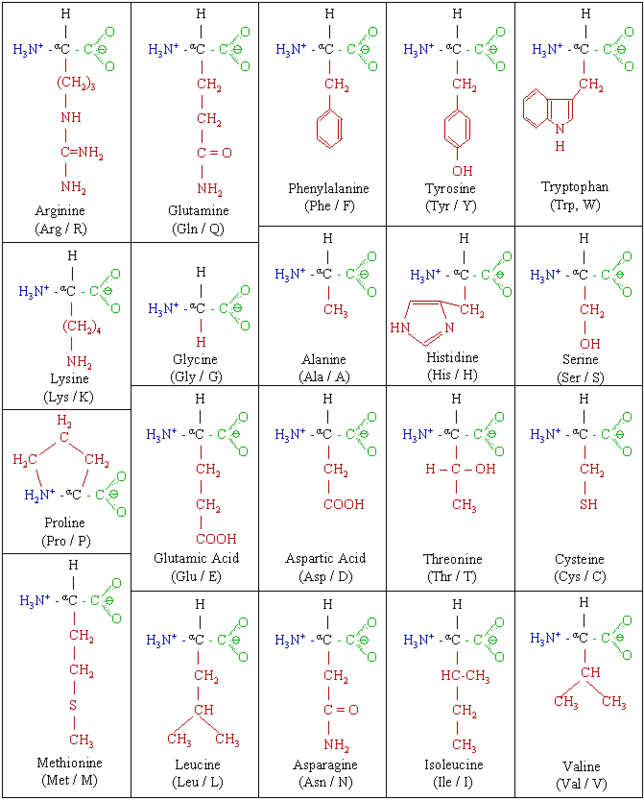 There are 20 different types of side chains for the 20 amino acids. Amino acids bond together to form long chains called polypeptides. 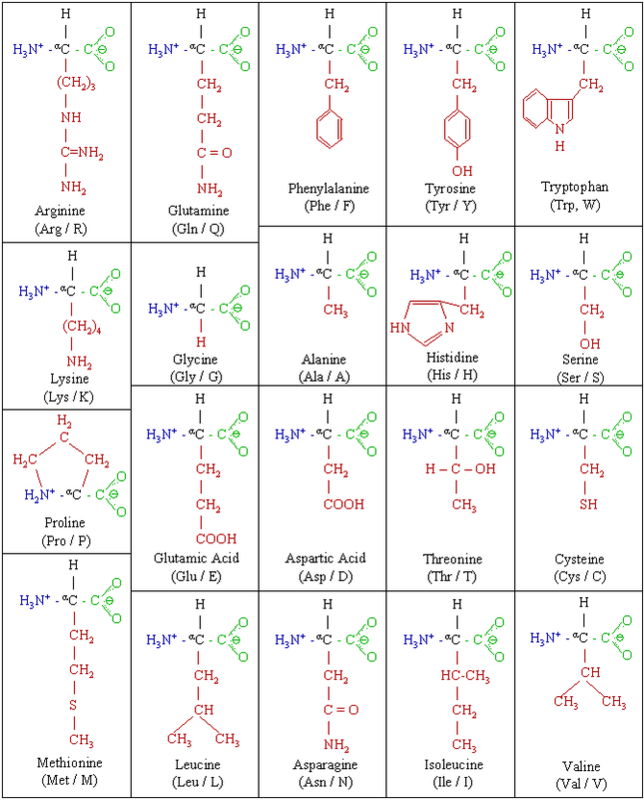 One or more polypeptide chains fold, connect and elaborate to form Proteins. Protein synthesis takes place inside our body. Out of the 20 amino acids, there are 9 which our body cannot synthesize. We get these only through nutrition. These essential amino acids are Threonine, Tryptophan, Valine, Lysine, Methionine, Phenylalanine, Histidine, Isoleucine and Leucine. When you eat a protein-rich meal, your body breaks down protein into its basic amino acids units. You can then use these to build up your own proteins. Animal protein usually contains all essential amino acids. They hold the genetic codes and reside in a cell’s nucleus, hence the name Nucleic acids. There two types of nucleic acids are Deoxyribonucleic Acid (DNA) and the Ribonucleic Acid (RNA). Both DNA and RNA play a role in protein synthesis. Nucleic acids are polymers of Nucleotides. They are the building blocks or monomers from which nucleic acids are made. A single nucleotide is made up of 3 parts: a phosphate group, a sugar and a nitrogenous base. The sugar group can either be a ribose and a deoxyribose sugar. Deoxyribose has less oxygen in it, hence the name deoxy--. Nucleotides in DNA have deoxyribose sugar while those of RNA have ribose sugar. The nitrogen base of nucleic acids can come as a single or a double ring. The single ring is known as Pyrimidines and the double ring is known as Purines. There are two types of purines – Adenine and Guanine. There are 3 types of Pyrimidines – Cytosine, Thymine and Uracil. Thymine is only found in DNA and Uracil is only found in RNA. The rest of the nitrogenous bases can be found in both DNA and RNA. How are Nucleic Acids Linked Together? A Nucleic acid is formed a number of nucleotides monomers are linked together. The sugar group of one is linked to the phosphate of another (Sugar-to-phosphate linkage), through a process known as dehydration synthesis – water is given off. A long chain of nucleotide will give rise to a nucleic acid. 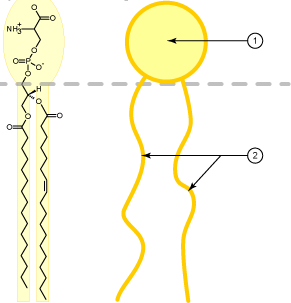 RNA is built in single strands while DNA is built in double strands. The two strands of DNA are held together by weak attractions known as hydrogen bonds. Hello there! I could have sworn I've been to this website before but after looking at a few of the posts I realized it's new to me. Nonetheless, I'm certainly happy I found it and I'll be book-marking it and checking back regularly! You could definitely see your enthusiasm within the article you write. The sector hopes for even more passionate writers like you who are not afraid to mention how they believe. At all times follow your heart.